The Labelscar website, which bills itself as the “Retail History Blog” writes today about a visit they made to our very own Carson Mall. 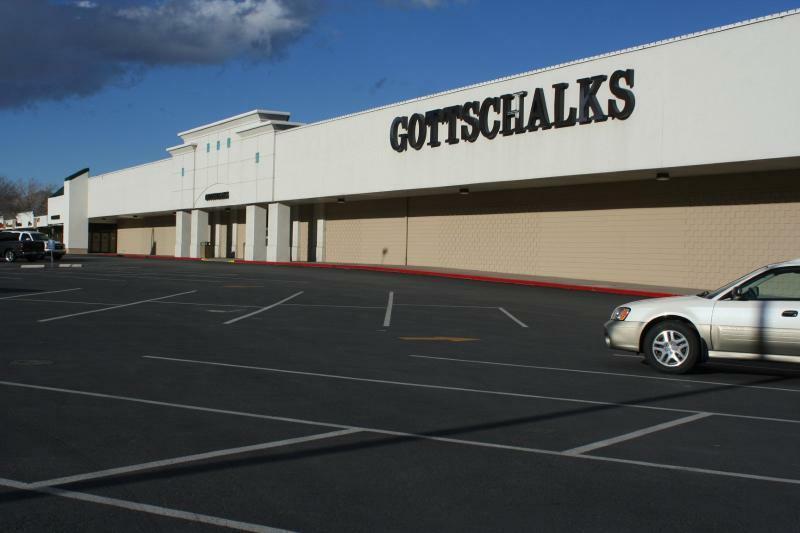 Their consensus is that it’s a “dead mall” and kind of doomed once Gottschalk’s closes. Hard to disagree. I’ve lived in Carson City since 1985, so I can fill in a lot of the gaps here. The Carson Mall was built before my time, in 1964. In the 1980s it was “double-anchored” by JC Penney. At the south, where Gottschalk’s is now, was the JC Penney clothing departments, and at the north end were the home departments. There was also a Sprouse-Reitz in the mall. JC Penney moved out and Gottschalk’s moved in around 1990 or so. The Carson Mall has always been kind of a ghost town, for the entire 25 years I’ve known it. The area with the Hawaiian BBQ was just remodeled last year; that’s part of their attempt to reenergize the mall. But back then they weren’t counting on Gottschalk’s going out of business. JC Penney moved to the Southgate shopping center around 1990, where it still is today. Soutgate was new at that time, and was anchored on the south end by a brand-new Walmart. It’s always been just a simple strip mall like it is today, and the few smaller shops between the two anchors have never been very successful. Walmart vacated in 2002 when a new Super Walmart was built on the hill at the south end of town. After Walmart left the building was bought by, I kid you not, Max Baer Jr, who played Jethro Bodine on Beverly Hillbillies. He bought it so he could build a Beverly Hillbillies themed hotel-casino on the site, on the scale of the mega-resorts in Vegas. But the owners of the mall and Penneys claimed the mall covenants prohibited casinos, so nothing happened with the building until Jethro finally gave up and sold it around 2007. He now owns land across the street from the new Super Walmart and hopes to still build his casino, but he’s still running into roadblocks. Jethro sold the old Walmart building in 2007 to a retail developer, who managed to lure in Burlington Coat Factory and Sportsman’s Warehouse with the promise of redevelopment funds. The north half of the Walmart was remodeled into Burlington, and the south half was demolished, then rebuilt on the same footprint to hold Sportsman’s (waste of brick if you ask me – no idea why they did it that way). But then Sportsman’s declared bankruptcy this year just as the finishing touches were being put on the building. So now it’s sitting there, empty, about 95% finished. I remember the Silver City Mall very well. I have a soft spot for that place, because back in the 80s my mother used to take my brother and I there every weekend. Silver City in the 80s was anchored by Albertson’s at the west and Kmart at the east. There was also a large Osco Drug and a big enclosed portion. Strangely, neither the Kmart nor the Albertson’s had entrances into the enclosed part. Inside there was a gym, a bookstore, a laundromat, a Japanese restaurant, a hair salon, a candy shop, and a couple of small places that sold clothes and gifts; whatever they could to entice people to shop there. The mall was cavernous and dreary, with high ceilings that disappeared into inky blackness at the roof. Small lights and dingy skylights tried to illuminate the interior and failed. The most popular place in the mall was the casino area, which was also right next to the front door and thus got the most sun. My mother would gamble there while my brother and I killed time looking in the bookstore or playing the four arcade games that were off in the corner. The Kmart was the largest store in town at the time, and you had to leave the mall and walk down the sidewalk to get to it, even though the two were attached. I used to get an Icee every time we went there. In 1994 Kmart built a SuperK at the north end of town, and vacated the Silver City Mall (The new store closed for good in 2003, leaving its strip mall adrift). Soon after Albertson’s left too. The Kmart space reopened as Ernst hardware and Albertson’s was remodeled into Office Depot. By 2000 Ernst had closed, and the mall was beyond dead. They decided it would be best to tear it all down and rebuild. Ernst and the indoor mall portion were demolished and replaced by a Lowe’s. A year or two later Osco (which had been renamed Savon) was demolished too, and a Petsmart built in its place. Only the Office Depot remains, inside the bones of the original Albertson’s. The area that used to be the “main” part of the mall, with the bookstore and casino, is now just parking lot. I had the presence of mind back in 2000 to shoot off half a roll of film of the Silver City Mall in its last days. I’ve never put them online because I have so much on my plate, but reading this post, and the lament over the lack of Silver City pictures, has prompted me to finally put them on the internet. As I should have long ago. By the way, when you were at the Carson Mall, you should have eaten at the Deli Francesco. That place I swear has not been remodeled since 1975. It’s a step back in time. Carson Mall – When I first moved to Carson in the early 70s there was a store at the south end called “Disco” or something like that, think of it as a k-mart/wal-mart type store, they went bankrupt. I remember the bankruptcy sale they had there, auctioning off everything in the store. JC Pennys came in and filled the slot. There also used to be a doctor’s office in the mall (north end near Safeway), a drug store, gun shop, and a stationary store. Silver City Mall – Skaggs Drugs was there at the begining, they actually had a connector to the mall. They were to the right of Albersons. There was also a Radio Shack and a book store (Kendneys?) there near the begining when it opened. In the mid-60s, Gray Reids department store was at the south end of the mall. Safeway market was on the north end. There was a drig store about the center of the mall. Can’t remember the name but the pharmacist was Keith Macdonald. Many changes happened since then. Will the malls ever succeed in Carson City? I remember the silver city mall in the late 70’s. Q’s BBQ used to be a fantastic restaurant called the “Sirloin Stockade” which served excellent steaks and burgers. Untill recently, the door handles still displayed the red stacked S’s logoed on them. Where cvs pharmacy sits was a restaurant called Hobo Joes which had a railroad theme that competed with Bob’s Big Boy. They even had a Hobo statue out front. What happened to Carson City’s character? Thanks Scott for the memories!